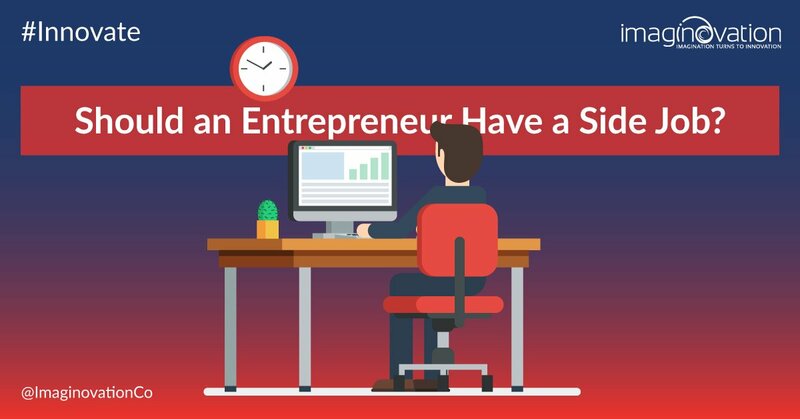 We live in the age of the “side hustle.” No one seems to have just one job or even one career anymore, but is a side job the right way to go for entrepreneurs? Is it realistic for you to run your own business and have another job for support? Starting your own business is tough on its own, but sometimes having a side job can take some of the pressure off. On the other hand, a side job can become a distraction that prevents you from putting everything you need to into your business. As with everything, knowledge is power. There are serious pros and cons to an entrepreneur having a side job and you should think about them carefully before deciding to go that route. The biggest challenge to getting a business going is income. It takes time for businesses to generate income that will allow you to support your financial commitments. Entrepreneurs can greatly benefit from having a side job that allows them to pay their personal bills without worry while the business grows over time. Financial stress is a make or break issue for businesses and if your side job allows you to give your business time to grow, it could have a positive aspect, even if your business grows slower. It’s challenging to stay grounded while making your own business work. It’s important that you stay realistic and on the ball in your business. There’s nothing like the rigor of having a boss to make you want to be your own boss even more. Who you know is arguably more important than what you know. A side job allows you to stay in the pool of people who are getting things done. A major issue for entrepreneurs is that they end up going it alone. Isolation not only causes you to lose networking opportunities, it also keeps you from being able to see where your industry is are and where they’re going. Many entrepreneurs have found partners in the workforce who made the difference in their success. A side job that’s related to the field of your venture can help you to find those people who you need to succeed. If you only work on your business 24/7, then you’re going to find that you can’t see anything outside of it. That’s a dangerous thing for entrepreneurs. Perspective is powerful, and when you’re away at a side job you have plenty of room for perspective. It’s a distraction that you’ll be hard pressed to find by other means. Working a side job lets you get the time that you need to step back and see where problems and opportunities are within your business. The best ideas tend to come when we’re not thinking about the subject. The more time that your brain has to digest the events and considerations surrounding your business, the better equipped you will be to have those “aha” moments that are so important for guiding your success. Do you have all of the skills that you need to make the most of your life as an entrepreneur? A side job can go a long way in helping you to build the skills that are necessary for you to forward your business. With a side job, you don’t have to spend time making mistakes as you get through the learning curve on a new set of skills – you can let whoever you’re working for absorb those mistakes. If you’ve got a side job, it means you’re not able to give your full attention to your entrepreneurial venture. There’s a reality to the split life that you’ll be leading if you’re working two jobs – you just can’t give everything to both. In order to keep your eye on the ball with a side job, you’ve got to be able to prioritize and work with the right mindset. If you can’t do that, then you’re better served to stick with one or the other. If you’re working for someone else, do you really need to be doing this whole “strike out on my own” thing? The make-or-break aspect of entrepreneurship is a powerful force in making you get it right. We as people tend to rise to the occasion. If you HAVE to make money in your business to provide for your family, then you’re more likely to do it. However, if you can skim by without pushing yourself thanks to a side job, then you’re less likely to give that final push of effort that you need to be successful. There are only 24 hours in a day. No matter how much we might like to try to find more hours, no matter how much we might wish that we could do everything, it’s just not going to happen. You’re not Wonder Woman. You’re not Superman. You can’t be everywhere at once. Having a side job is going to cut into your time. You’re going to have to make choices about which things you can do, and that’s going to mean putting your business on the back burner at times. If you’re committed to your venture, then why aren’t you committing to it full time? Having a side job can call into serious question your commitment to what you’re doing. Making your venture the central priority in your life is one of the ways that you signal to yourself and to your family and friends that you’re serious about it. When people take on side jobs, it tends to make others think that they’re not serious about their venture. It calls into question what this whole thing is about. Are you a serious entrepreneur if you’ve got a side job? That’s a question you’ll have to answer for yourself. If you do decide to take on a side job as you’re building your business, your thinking is going to be important. Which is your primary business and which is your “side hustle”? A major danger of taking on a side job is that you’ll start to think that your entrepreneurial venture is a “side hustle”, in which case you’re going to have a hard time finding the passion for it that you need for success. If you do decide to take on a side job as an entrepreneur, make certain that you are clear about which venture you’re in for the long haul with. Language, planning and vision are everything, no matter what actions you might need to take along the way to support your end goal. Entrepreneurs: Did you have a side job when you first started your business? We’d love to hear your thoughts on how it helped (or hurt) your venture!